So I know you hear me talk about diapers a lot, but honestly, being a mom means that diapers become a huge staple in your life. Trust me on this, with a bad diaper, your day can be totally ruined. Last week I was at an event with a bunch of kids and Livi and I were there for about three hours. I changed her before we left the house and generally don’t worry about her diaper again until we are home, or she poops. As we were gathering up the kids to take them home, I noticed friends sons diaper was literally the size of a balloon… I asked if he had pooped and she said no, but that this brand of diapers (not Pampers) always looked like that after a couple of hours. I couldn’t believe it. Livi’s has NEVER looked like that, and I’m thankful that Pampers is so absorbent. I can’t imagine how uncomfortable the poor little guy must have been! Secondly, the smell. Ok this is probably going to sound weird to you, but the smell of Pampers diapers brings me back to my childhood. I used to make my mom buy me newborn Pampers diapers so I could put them on my dolls. The second I opened my first pack for Livi, the nostalgia of my childhood immediately rushed in and it was such a surreal moment to remember changing my dolls, as I was about to change my real baby. It was likely the hormones, but it brought tears to my eyes. Thirdly, I love that I get to collect points and cash them in for goodies with the Pampers Rewards Program. I appreciate a company that gives back, and it makes me feel better to know that I’m earning rewards for something that I have to buy weekly. Plus, I feel super cool every time I scan a barcode. Lastly, it makes life a breeze when I can directly auto ship my Pampers products from Amazon with their Subscribe & Save program. There is nothing worse than forgetting to get diapers and realizing you have none left after your baby has a blowout. With auto ship, they are delivered right to my door every month and that makes this momma a very happy camper. It’s funny, as I sit here writing this, if you had asked me two years ago if I would truly LOVE a diaper, I would think you were crazy… haha how times have changed!! Guten Tag from Germany. After a 20 hour travel day from door to door, we finally made it to Germany to see Jeremy. As you all know, I am down an arm at the moment, so my mom came with me to help us out for a few weeks. Travelling with a baby is never easy, but with one arm it would have been impossible. 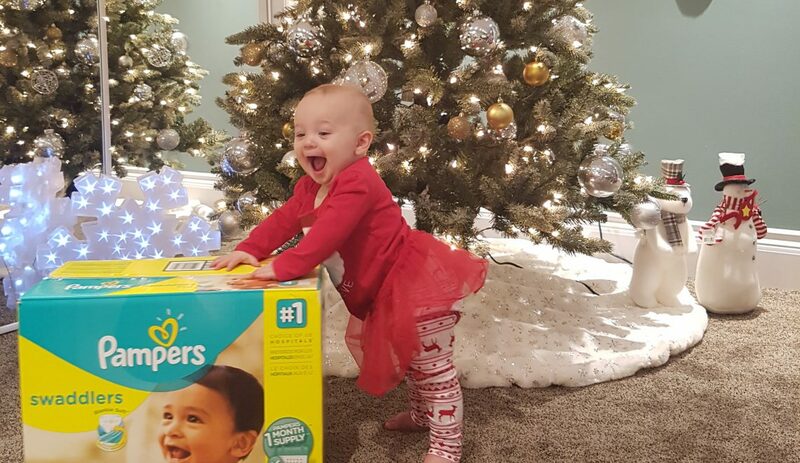 Here are some tips (including my favourite Pampers diapers!) that helped me get through the flight, as well as how I am dealing with Olivia’s jet lag. Hopefully these will help any of you travelling with babes over the holidays. Keep Baby Dry—this is most important! We all know a wet baby is a cranky baby, so I use Pampers Swaddlers to keep Olivia dry and happy. I love Pampers Swaddlers because they are a blankie soft diaper and have a unique absorb away liner, which keeps wetness and mess away from the baby’s skin. Swaddlers also have the wetness indicator, which changes colour making it a breeze to check her to see if she needs a change when we’re in public. Let There be Light—I learned my lesson the hard way on my last trip to Germany. I arrived at noon after flying all night, and promptly took Olivia to bed with me in a dark room for 8 hours. A 6 hour time change is never easy to combat, but I’ve learned that light makes all the difference. It took me two weeks to get her back on track after mixing up her day time and night time. I now make sure to keep her in the light all day, even for naps, and the dark for the night, even if she wakes up. Dimming the lights when you’re getting your baby ready to sleep, lowering them more and more as bedtime approaches is a great way to create a soothing atmosphere. It’s amazing how much faster she adjusts to the new time zone just by light and dark. Keep it Cool—Olivia will not sleep if the room is too hot or too cold. Each baby works differently, but for Olivia the cooler the better. I keep her room at 18 degrees and I put her in a sleeper and sleep sac. Rule of thumb is to dress your baby in no more than one more layer than you would wear yourself, based on the room temperature. White noise—I don’t know anybody who doesn’t sleep a little better with white noise, and this goes for baby too. Babies sleep better with the washing machine or the vacuum running, so feel free to go about your regular routine during naptime or after bedtime. I use a fan on high facing away from Olivia to keep her sleeping soundly all night long. Relax! Babies pick up on our anxiety and frustration. If I’m stressed out, Olivia feels it, and the last thing she will do is go to sleep. Just know that you are doing a great job, and enjoy every minute with your beautiful baby. I will let you know how our jet lag goes, but so far it is looking great! Since I announced I was pregnant, I have been bombarded with advice. Most of which is about how to feed my baby. I had every intention of fully breastfeeding Olivia, but unfortunately, after months of trying (and several specialists), I realized that I would need to supplement as Olivia’s needs grew. I researched a lot about formula, and knew I wanted to give her a formula that was enriched with DHA. A baby’s brain contains Omega-3 fat and most of that fat is DHA, an important building block of the brain. By age 3, babies brain growth is 85% complete, so I realized the importance of making sure she was getting the nutrition she needed for optimal health. Enfamil A+ is enriched with DHA, which made it a clear choice for me. I use the ready feed bottles (which make my life SO much easier), and I feel happy knowing I’m giving her everything she needs.